The ADR-50C provides basic, reliable, versatile on line inspection and control of sealed containers with metal, or metalized closures of 2 to 6 1/4 inches (50-165 mm) in diameter. The ADR-50C identifies and rejects all common mechanical and process related defects such as missing & misapplied lids, low/high internal pressure or vacuum deviations, knocked down flanges, "leakers", "swells", etc. The ADR-50C Universal Closure Monitor provides an extremely easy-to-use format with our unsurpassed accuracy for online measurement of internal pressure or vacuum of metal, glass or plastic containers. Reliable operation of 1200 c.p.m with ejections from the line of "out of limit containers" assures the quality of your product in the marketplace, as well as timely alarm if your process strays. Installation is simple and fast. The unit mounts to your conveyor and is available for on-line mount (ADR-50C Standard unit) & (ADR-50CP Micro Adjustable) or Remote mount (ADR-50CR Remote). The ADR-50CR uses a stainless steel remote cabinet that can be mounted up to 30 feet (9 meters) away from the sensing head that is mounted on the line. There are no extras to buy. 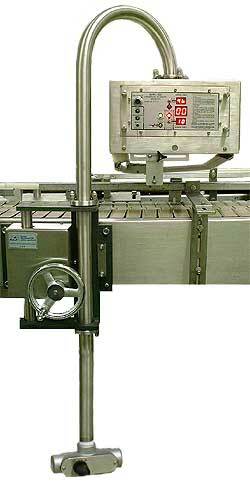 Self-contained instrument mounts directly to customer's conveyor, instrument housing/sensors and control panel supported over the conveyor with stainless steel "cane"
Contact you representative in you area or contact us at Food Instrument Corporation. You send us your monitor without cane and lifter and we will convert it to what you want. Average lead time is one week from the time we receive your unit to time of shipping.